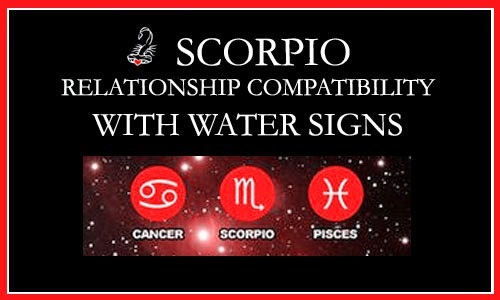 Traditionally, Scorpio and Pisces are astrological soul mates. Both are deeply emotional, intuitive, sensitive, and loving. It is both the similarities and differences in which they express their love which draws these two together like magnets. Upon uniting, they feel like no one else can understand the depth of their emotions like their lover has. Scorpio tends to be very mysterious, imbued with passion and intensity. This intrigues Pisces and draws them to Scorpio, curiously tickled by Scorpio’s sensual and seductive nature. Scorpio is drawn to Pisces’ kind and warm spirit, which was obvious from the moment Scorpio lay their eyes on Pisces. Pisces looked like someone who would also protect and care for them, and who genuinely cared about Scorpio’s well-being and happiness. With time, Scorpio develops more trust in Pisces than they do in most other human beings. Pisces is able to draw out the goofier, loving, and more care-free side of Scorpio’s nature. In a Scorpio/Pisces relationship, both signs often feel like they have found someone who understands them without the need for words. This relationship can flow so well that one or both of them may be tempted to stir up trouble just to keep things exciting. But there is no need to worry that things are “too good to be true”… there is a reason they both found each other. They both just “get” each other, and being around each other’s presence is a driving force in both of your lives. Scorpio and Pisces complement each other, or rather, they complete each other. There are times when Pisces’ imagination may get the best of them and Scorpio may not understand their overly subjective perspective, but those times are rare. As long as they both keep the lines of communication open and transparent, they should feel mere harmony — for the most part. Scorpio has a tendency to be possessive and jealous of their lover, but it is in Pisces’ nature to actually enjoy the extra attention they receive from Scorpio. Pisces also gets jealous, but does a better job of hiding it by pretending not to notice. Pisces always shows Scorpio devotion, and that matters a lot to Scorpio because Scorpio cares about action more than words. As long as Pisces constantly reassures Scorpio of their loyalty and faithfulness, Scorpio will bask in their attention and make them very happy. Pisces and Scorpio both seek each other’s affection more than anything else, because they feel like you have known each other for an eternity, even if they just met recently. A Scorpio/Pisces relationship only grows stronger with time, especially if both signs are able to give each other space. At first they may both be like two peas in a pod, clinging to each other’s hips. However, if they do not spend time apart it will be too easy to get lost in the relationship, and this won’t result in a healthy partnership. Spending time pursuing individual passions will only strengthen your bond in the long-run. Scorpio and Cancer interact on a highly intuitive and subjective level. They often understand what each other wants or needs based on the way they look at one another. Many unspoken vibes are shared between them both, emotionally strengthening their relationship. Cancer appreciates Scorpio’s loyalty, dependability, and commitment to the partnership. Cancer is able to understand Scorpio’s deep need for privacy, and is always there for them to return to after periods of isolation. Cancer seeks a strong and reliable partner to spill their secrets to, and Cancer often feels as though they have found one in Scorpio. Scorpio loves the fact that Cancer is a shelter they can always turn to — a spiritual haven. Cancer is tied to domesticity and their home. Cancer loves making their home comfortable, warm, and welcoming for Scorpio. Their family, friends and loved ones are Cancer’s utmost priority. Cancer will often put Scorpio’s needs above their own, and is an excellent counselor. Cancer has a selfless heart and is naturally willing to help Scorpio during their most challenging moments. As Water signs, both of Scorpio and Cancer bond very intensely to those they love. They can be very controlling, particularly Scorpio. Luckily in this case, neither Scorpio nor Cancer are likely to be turned-off by this behavior because they both openly exhibit it. Cancer and Scorpio feel comforted knowing that their partner is as emotionally attached as they are. Cancer is prone to being more moody than Scorpio. Although Scorpio is understanding, she can also be confused by Cancer’s sudden shifts in mood, and Scorpio may lose their patience with Cancer. Scorpio is more willing to express the complete extremes of their passionate emotions. That means when Cancer gets offended or hurt they may become angry or aggressive. Cancer has a much more passive-aggressive response when they feel frustrated — they tend to withdraw into his shell. Cancer is so intuitive that they can often sense when something is wrong with Scorpio, even if Scorpio does not outwardly express it to Cancer. This makes Scorpio feel understood in a world where they are so often misunderstood. Scorpio is a Fixed Water sign, and when two Scorpios enter a relationship, it is either heaven or hell, no in-between. These two were drawn together because of their undeniable magnetism. There is an electric current which seems to link two Scorpios together, and the passion they both have is undeniable. The potential downfall with a Scorpio-Scorpio relationship is that they are too similar, so the mind games they usually play with another signs won’t fly with their Scorpio partner. They both have the ability to see right through each other, down to each other’s soul. This fact either makes them either uncomfortable or very intrigued. It is almost guaranteed that two Scorpios can become obsessed with one another and the way they make each other feel. Upon meeting, they probably felt like it was the first time someone understood them and could empathize with their feelings so well. They share a telepathic bond, and when one of either of them are not feeling well, the other immediately senses those frustrated feelings and will do anything to make them go away. Scorpio is an all-or-nothing sign, so when these two love, they love with all of their hearts. And when they hate, they hate just as fiercely. This is why it is incredibly important for them both to beware during their arguments. They can both be very destructive with their words and may end up saying something they regret. As Scorpios, they are both very sensitive and do not forgive or forget easily, so if one or either of them harm each other verbally or emotionally, it may take a long time for them to get over such a setback. The more positive these two are in this relationship, the greater of a chance that it will succeed. They feed off of each other’s energy, so they should keep it upbeat and transformative. There is a high chance that this relationship could become a lifelong commitment, such as marriage, because they both are not the type to engage in casual or short-term relationships. They both are in it for the long-haul. If they both decide to break down their tough walls and trust each other with their deep, dark secrets, their link will strengthen and deepen even more. This is a relationship that will stand out for the rest. It will be memorable both for your stormy arguments and your passionate make-up sessions. They will challenge, push, and pressure one another to be the best they possibly can. They both want to be number 1 in all that they do, and that includes having the number 1 relationship. If these two choose to let their positive attributes (strong intuition, empathy for those in need, passionate and determined nature, loyalty, faithfulness, and their depth of character) overcome their negative attributes, then this placement will be one of the strongest pillars for a long-lasting and joyful partnership.